When it comes superhero movies, Marvel is killing it. I mean, it's been ten years, and Marvel is showing no signs of stopping. So, to be honest, just like when Zemo noticed a little bit of green in the blue of Cap's eye, it's kind of nice to find a flaw. 1. In Guardians of the Galaxy, the Nova Corps say that Gamora is the last surviving member of her species. It's established in Guardians of the Galaxy that Thanos destroyed Gamora's home planet but spared her and raised her as his adopted daughter. But, in Avengers: Infinity War, Thanos says that Gamora's home planet is thriving because he actually only wiped out half the population. It's kind of weird that Gamora never mentioned the fact that her people still exist and that even the Nova Corps believed that her planet had been destroyed. 2. Tony Stark supports the Sokovia Accords in Captain America: Civil War, but then he helps train Spider-Man as a vigilante. Just to recap, the entire premise of Captain America: Civil War hinges on the fact that Tony Stark and Steve Rogers disagree when it comes to the Sokovia Accords. Tony believes that the Avengers need to be put in check, but he also encourages Spider-Man to become a vigilante... even though that's exactly the kind of thing the Accords are supposed to prevent. Tony literally severed his relationship with Steve and his team over the Accords, but Spider-Man gets a pass? 3. We need to talk about the Hulk piloting the Quinjet in The Avengers: Age of Ultron because it's really silly. If you're a Marvel fan, then you're probably aware of the controversy surrounding Hulk's sudden ability to pilot a ship in Avengers: Age of Ultron. Well, it's still infuriating. The Hulk isn't Bruce Banner, people. Also, was the Quinjet really capable of space travel? According to the events of Thor: Ragnarok, the Quinjet was sucked into a wormhole and landed on Sakaar, which seems like a lot for a jet that was never supposed to leave Earth's atmosphere. Oh, well. Thor: Ragnarok was awesome, so I'll let this one slide. 4. Vision is kind of dumb. For a dude with infinite intelligence, Vision sure makes a lot of mistakes. Many Marvel fans are bothered by the fact that Vision didn't simply destroy the Quinjet in Captain America: Civil War. Instead, he ineffectively drops an air traffic control tower over the garage entrance. 5. Tony Stark has figured out how to rapidly heal human bodies, but he never uses it again. In Iron Man 3, we were introduced to the Extremis virus, an advanced genetic mutation that allows the human body to regenerate from physical damages. It also causes people to explode. But after Pepper Potts was infected, Tony was able to develop a cure that stabilized the effects of Extremis. So that means Tony can stabilize people after they've reaped the benefits of Extremis regeneration. Remember, Pepper fell from a huge height, but she survived thanks to the virus and was fine when she was cured. Ummm, you know who else fell from a huge height and would probably like to walk again? Tony's best friend, Rhodey. 6. That "eight years later" title card in Spider-Man: Homecoming. 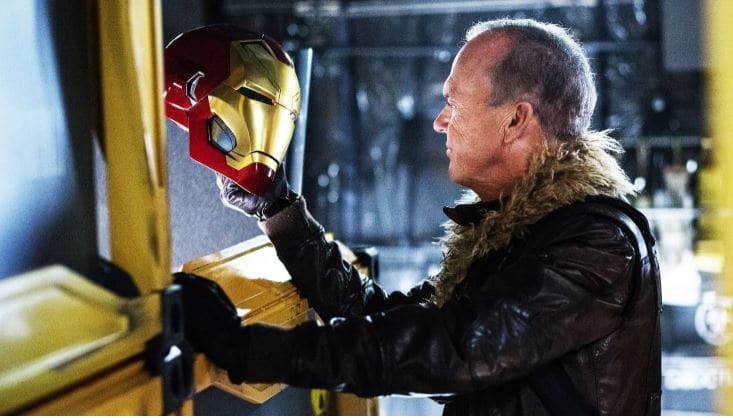 In Spider-Man: Homecoming, we are introduced to Adrian Toomes, the owner of a salvage company who becomes a criminal after a joint venture between Tony Stark and the Department of Justice put him out of work. A title card indicates that Toomes turned to a life of crime immediately after the Battle of New York and that the events of Spider-Man: Homecoming take place eight years later. However, The Avengers is supposed to take place in 2012, which would mean Homecoming happens in 2020. That would then mean that Homecoming happens after Avengers: Infinity War, which is set in 2018. 7. Obadiah Stane is a natural pilot, apparently. One of Marvel's earliest comedic moments is a scene in Iron Man where Tony Stark is attempting to pilot his very first Iron Man suit. It takes him a while to get the hang of it and he even launches himself into a wall during one attempt. But when Obadiah Stane dons his larger and bulkier Iron Monger armor, he pilots the thing without a hitch. Umm, that's really impressive, dude. Tony Stark had literally just invented the technology (in a cave! ), so it's not like Obadiah could have had much practice. 8. And finally, why didn't Doctor Strange use a portal to cut off Thanos's arm in Avengers: Infinity War? In one of the earlier scenes in Avengers: Infinity War, Doctor Strange and Wong close a portal that severs Cull Obsidian's arm. You know who else has an arm that's sporting some pretty important jewelry in Infinity War? Thanos. Remember when Doctor Strange was tossing Spider-Man through portals to help him fight Thanos? Why not just close one of those bad boys right over Thanos's arm or head? I guess that wasn't in the one possible outcome where the good guys win. Do you know any other Marvel mistakes that we missed? COMMENT and let us know and TAG a friend!